To begin with: The Gigaset PCI Card 54 is incredibly fast. With data transfer rates of up to 54 Mbps even large downloads are simply a pleasure. Linking your PC to your laptop or other computers becomes a piece of cake, and no one gets tangled up in cumber-some cords while surfing the Internet. 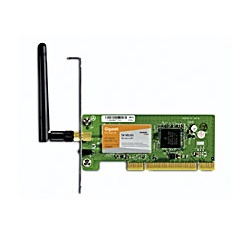 In addition, installing ad hoc Wireless Networks linking existing computers in the house with each other without a router is possible by using the Gigaset PCI Card 54. For using WPA you must have Microsoft Windows XP as operating system. Furthermore you need Windows XP Service Pack 1 and Microsoft Windows Patch No. 815485.